A search and rescue operation was launched after Mr Van Zyl's dogs returned to their camp without him. The hunter's footprints were traced to river bank alongside his discarded rucksack. He was married, had two children and took foreign clients on hunting trips. Mr Louwrens said staff from the Heritage Protection Group - an organisation which he heads and helps police fight crime in South Africa - informally helped the Zimbabwean authorities conduct the search. 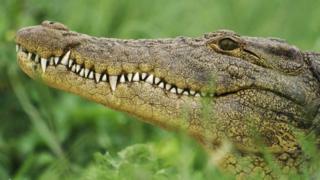 "Permission was given for three Nile crocodiles in the area to be shot, and one of them contained Mr Van Zyl's remains," he said. "Subsequent DNA tests have proved the remains to be those of Mr Van Zyl." One conservation group meanwhile has condemned the circumstances of his "senseless" death. "[He] shouldn't have been hunting in the first place. Animals in the wild… are wild! They are living, thinking beings with instincts for survival," a statement by One Green Planet said.